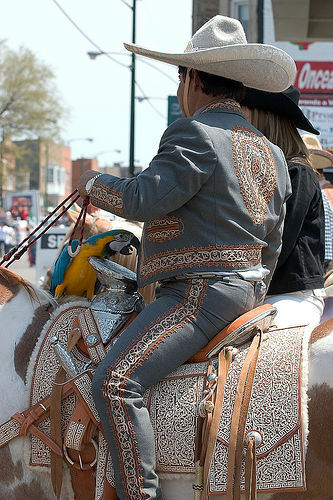 This is a wonderfully detailed Mexican style saddle on a parade horse - not sure if it's in Mexico or the USA. Go to the flickr page to zoom in and see the intricate detail of the pattern. The rider's coordinated outfit is nifty, too, and there is a blue and gold Macaw along for the ride! !